How do I open a LZMA file? Open LZMA files with BitZipper! LZMA files are a bit like the more well known ZIP files, but they can only contain one file that has been compressed in size, whereas e.g. ZIP can contain multiple files. LZMA are often used to compress an archive file, which can contain multiple files but not compress them. 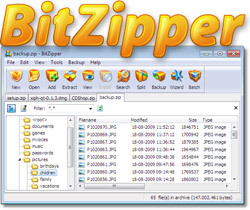 BitZipper will restore the file in your LZMA file to its original format. After installing BitZipper, you can open a LZMA file simply by double-clicking it, by right-clicking on it in Windows Explorer, or by starting BitZipper and opening the LZMA file the same way you open a document in your word processor. It really is very simple with the right tool.